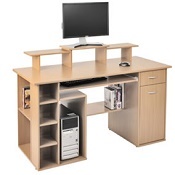 A stylish computer desk which includes 2 shelves beneath the desktop, a raised desk top printer platform, a CPU storage cabinet with a shelf, 2 stationary drawers and a space saving smooth pull out keyboard shelf which allows for a better arm position whilst typing. 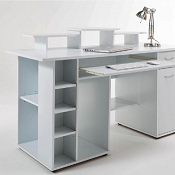 Constructed from high quality laminated MDF (which matches our range of office furniture), these attractive desks have a solid build design so are sturdy and stable during use. Easy to assemble with full instructions and tools included. These desks offer a generous working surface of 120cm wide x 55cm deep (47" x 22") and stand 85cm (33.5") high. The base of this unit measures 118cm x 49cm. The maximum PC size is 41.5cm high (54.5cm without the shelf) x 47cm deep. The clearance under keyboard shelf is 65cm high x 52cm wide. - Practical retractable keyboard tray and substantial storage space.